Sampath Bank and Hatton National Bank (HNB) recorded contrasting wins to qualify for the final of the inaugural Mercantile Cricket Association Super Twenty20 Championship in the first semi-finals of the competition played at the BRC ground in Colombo yeserday. Sampath Bank exploded to inflict HSBC with a 7-wicket defeat in the first semi-final while a sensible partnership of 90 runs for the sixth wicket from Nimesh Perera and Mevan Fernando guided HNB to a thrilling 3-wicket win against Commercial Credit in the following game. 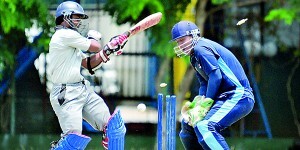 Sampath Bank’s Kaushal Silva is clean bowled. Commercial Credit for 139 runs in exactly 20 overs and being at a hostile position at 48 for 5 wickets, Perera and Fernando put HNB back in the saddle, as they made a dramatic fight back to record an exciting win with a delivery to spare. Despite the Coorays, Dilhan and Ranga, picking three wickets each, HNB stormed their way to the final after Perera led the onslaught with a 42-ball 53 as he smashed three each of sixes and fours during his knock. Fernando supported him well with knock of 38 from 31 deliveries inclusive of four boundaries and a six. HNB will take on Sampath Bank in the final which will be played today at 2.00pm after the third place playoff between losing semi-finalists HSBC and Commercial Credit which will begin at 9.30am. Both matches will be played at the NCC ground in Colombo.